Hurricane Isabel (2003) as seen frae orbit during Expedition 7 of the International Space Station. The ee, eewall, an surroondin rainbands, characteristics o tropical cyclones, are clearly visible in this view frae space. A tropical cyclone is a rapidly-rotatin storm seestem characterized bi a law-pressur center, strang winds, an a spiral arrangement o thunnerstorms that produce hivy rain. Tropical cyclones typically fairm ower lairge bodies o relatively wairm watter. Thay derive thair energy frae the evaporation o watter frae the ocean surface, which ultimately recondenses intae cloods an rain when moist air rises an cuils tae saturation. This energy soorce differs frae that o mid-latitude cyclonic storms, such as nor'easters an European windstorms, which are fueled primarily bi horizontal temperatur contrasts. The strang rotatin winds o a tropical cyclone are a result o the (partial) conservation o angular momentum impairtit bi the Yird's rotation as air flaws inwairds taeward the axis o rotation. As a result, thay rarely fairm within 2° o the equator. Tropical cyclones are teepically atween 100 an 4,000 km (62 an 2,485 mi) in diameter. The term "tropical" refers tae the geographical origin o these seestems, which usually fairm ower the tropical oceans. 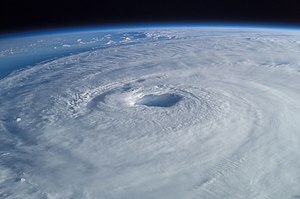 The term "cyclone" refers tae their cyclonic naitur, wi wind blawin coonterclockwise in the Northren Hemisphere an clockwise in the Soothren Hemisphere. The opposite direction o circulation is due tae the Coriolis force. Dependin on its location an strength, a tropical cyclone is referred tae bi names such as hurricane (/ˈhʌrᵻkeɪn/ or /ˈhʌrᵻkən/), typhoon /taɪˈfuːn/, tropical storm, cyclonic storm, tropical depression, an simply cyclone. In addeetion tae strang winds an rain, tropical cyclones are capable o generatin heich waves, damagin storm surge, an tornadoes. Thay teepically weaken rapidly ower land whaur thay are cut aff frae thair primary energy soorce. For this raison, coastal regions are particularly vulnerable tae damage frae a tropical cyclone as compared tae inland regions. Hivy rains, however, can cause signeeficant fluidin inland, an storm surges can produce extensive coastal fluidin up tae 40 kilometres (25 mi) frae the coastline. Tho thair effects on human populations are eften devastatin, tropical cyclones can relieve drocht condeetions. Thay an aa carry heat energy away frae the tropics an transport it taeward temperate latitudes, which mey play an important role in modulatin regional an global climate. This page wis last eeditit on 12 Apryle 2017, at 19:55.